Asphalt Paving Contractor Reviews - Copeland Paving Inc.
Our customers couldn't be happier about our high level of service and craftsmanship! "Quick note, saw what an excellent job was done, from start to finish. Customer service was outstanding and the finished product was equally good. I'd have no hesitation in recommending Copeland Paving. Many thanks!" 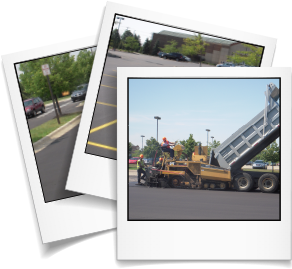 "As you can imagine, heading up the task of repaving our parking lot was no easy task. While obtaining the initial quotes from paving operations around town, I got the impression that most paving companies have not been in business very long and lack the most basic form of customer service skills. If they treat a potential customer this way while quoting, how will I be treated once the check is cashed and the work is done, should a problem arise? I selected Copeland Paving to do the job. From the initial meetings to the final execution of the project, I was confident that I had selected the right paving company for the job. Doing a complete tear out of our lot while keeping our doors open and shopping and receiving operational would have been impossible had it not been for your understanding, cooperative and courteous staff that worked around our shipping schedule. Once the project was complete I went out and looked it over. I could not find a single problem with the lot! Everything went as planned. The job was done. The lot was fresh and new. Everything had been cleaned up. I wish I could have this experience with every business thatI deal with. I was once again reminded that I had selected the right paving company for the job and couldn't be happier about that. Thank you so very much for making this project as painless as possible. Every encounter with you or any one of your employees has been a pleasure. Should you ever need a reference or a recommendation to anyone about your work, please don't hesitate to forward them my contact information. I will be happy to answer their questions and let them know how great the job is that you do." - Dan W., Torsion Control Products, Inc.
"Good afternoon Curtis, and thank you for another fine job on our road. At a most reasonable price, too. Your crew was terrific and your professional approach in assisting us is most appreciated." - Best Regards, Ron G.